What is a Class 3 Trailer Hitch? Do I Need a Drop Hitch? How Much of a Drop Hitch Do I Need? 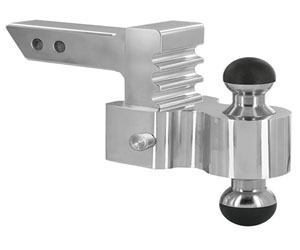 What is the Standard Size Trailer Hitch Ball? What is Standard Trailer Hitch Height? Can a Class 2 Ball Be Used with a Class 3 Hitch? What is a Tow Receiver? Buying the best trailer hitch is not as easy as going to the local automotive workshop and picking any of the trailer hitches. That might turn into disappointments of failed installation or broken tow-bars due to excess weight. There are more factors you need to consider before you can buy the best trailer hitch. Having spent numerous times assessing and using a variety of trailer hitches on the market, I am in a good position to help you to choose the best hitch for your trailers. In this quest, I will be saving you lots of money and time of searching for the specific trailer hitch in vain. If you are new to the world of hauling trailers, you are not lost because this guide was exactly created to accommodate everyone. Keep reading as I unfold the best trailer hitch on the market. I have also highlighted the pros and cons of each trailer hitch to make your choice quick. I owned a various assortment of trailer hitches and I was very excited to be able to put them away and go to one Andersen hitch that won’t rust. It’s made of all aluminum. Let’s check it out. This is the Andersen polished aircraft aluminum. It’s an all in one hitch. It has two different sizes, 2″ ball and 2-5/16″ ball. If you want, you can change this out and you can get a 2″ and 1-7/8″. I rarely haul anything that’s 1-7/8″ anymore. Pretty much, anything that’s single axle is a 2″. Actually, even the log splitter that I just recently rented, that takes a 2″ and that’s a pretty small trailer. And then, a t 2-5/16″ is pretty much any tandem axle trailer. This hitch has 4″ drop, or rise. It has a greaseless ball, which is awesome. Okay, so setting this up is very easy. If you wanna do the 2-5/16″ ball ball, then all you do is slide and put the locking pin on a side. Then, just go ahead and put that into your vehicle receiver and fix another the locking pin there. And you have different adjustments, so you can have it sticking further or have it go in further, depending on what type of clearance you need behind your vehicle. Very simple and very versatile. Let’s take a quick look at some of the features. So, one of the first things to mention about is aluminum, that it won’t rust, chip or peel. As you know, some of the steel hitches may rust out. This has a 4″ drop or rise and greaseless combo ball. The greaseless, I do have to quick mention is you can see the top half has this slicker surface on both sides and you have a lifetime replacement warranty on this nylon cap. I don’t know how long you would go before that ever wears out. But the nice thing is, you’re not ever rubbing up with your jeans up against a ball hitch after you grease it. I don’t know how many pairs of jeans I’ve come across where I end up getting that grease, and it’s really hard to get that out in the laundry. 100% USA made, support USA jobs. This hitch has up to 10,000 pounds max GTWR. A 15 hundred pounds max tongue weight. It’s V5 and SAEJ684 certified. You can also get a 2.5″ receiver with the select sleeve. The ball weight rating, on a 1-7/8″ ball, maximum weight 7,500 pounds. On a 2″ ball, it’s 8,000 pounds. And a 2-5/16″, 10,000 pounds. You can get additional locking pins. So, if you want a lock one pin right to your towing vehicle you can get a locking pin for that, and then the other one too. If you wanna make sure that no one’s gonna steal your trailer, or actually if you just had something like this sitting in the parking lot, this I believe runs around $200. So it’s probably a good idea to take it off when you’re not using it, or get locking pins when you leave it on there so you protect this investment. 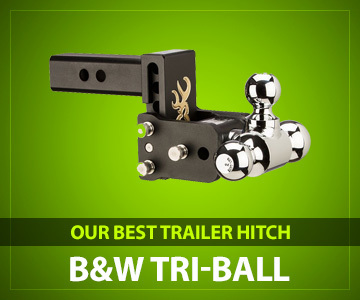 Instead of buying specific trailers to accommodate different tongue sizes, the B&W TS20048B Tow & Stow Tri-Ball Hitch brings you a variety of three balls. If you want to haul a different trailer, you can simply switch the balls by rotating them around until the required is on top. The first ball tows up to 3500 lbs, the second up to 7500 lbs and the third up to 14500 lbs. This trailer hitch can save you money because of its versatility. Although it is relatively expensive, I would invest more in a versatile tri-ball hitch. One might say it combined the class level 1 until 5. You don’t have to choose individual hitches with different ball sizes. Also noteworthy is the hitch’s ability to provide up to 5-inch drop or 4.5-inc rise. The height can be adjusted with an inch increment. Performance-wise, it performs well with a durable steel construction. Corrosion is my least worry because of the corrosion resistant black powder. The pins and the clips are sturdy and also rustproof. Furthermore on features, I applaud this trailer hitch with the convenience to stow the balls and the ball mounts under the vehicle when not in use. To achieve this is a simple task by removing the pins and then flipping them underneath the hitch for a safe storage. And for anti-theft, the locks can secure the balls without the need for additional locks. Is it really worth your penny? My answer is a yes on this trailer hitch. We seldom haul a one type of a trailer, so imagine the hassles of finding different ball sizes for each trailer you intend to haul? Thanks to the variety of ball sizes and the adjustable ball heights. I would surely recommend the hitch to many car owners of different cars. Nonetheless, you are still expected to ensure that the hitch fits the vehicle make, model and year. Take note of the maximum capacities for each ball size. Curt is a renowned manufacturer of trailer hitches from class 1 through to class 5. Its hitches are characterized with quality and custom designs. Almost for every model you can find a specific trailer hitch that will ensure simple installation and a reliable connection. When choosing the trailer hitch, all you need is the vehicle make, model and year. Curt 13068 class 3 comes with quality features and is suitable for a broad range of vehicles. It is, in fact, a common class of hitches customary with car-owners. What’s impressive is that it can be installed on a variety of vehicles such as the mini-vans, mid-size trucks, and crossover SUV’s, and pickup trucks. Moreover, I am impressed with its capacity to pull a trailer of a maximum weight of 3500 pounds. But, if combined with the weight distribution hitch, it can even haul a trailer of a max weight of 5000 pounds. The usual tongue weight is 350 pounds, which can be extended to 500 pounds when combining it with the weight distribution hitch. Weight distribution hitches are an added advantage if you want to increase the capacity of the hitch. I often worry about rush and UV damage on the trailer hitches, but Curt has ensured that this trailer hitch lasts as long as possible. It is coated with a finish, liquid Bonderite and black powder, to protect it against harsh environment. It is further backed with a lifetime warranty. The finish is given a year’s warranty. Important: To err on the side of caution, do not go below the lowest weight capacity for towing components. Anyone wishing to take a multi-day adventure in the wilderness with huge luggage can find this hitch helpful. However, just ensure that it matches with your vehicle and trailer make. Take into account the maximum allowable gross trailer weight and the tongue weight. Having come across this class 3 trailer hitch and actually tried on my Honda SUV, I would recommend it to those hauling the utility trailers, mid-sized boats and mid-sized campers. The hitch is versatile and can add convenience to your vehicle. I personally recommend this trailer hitch to anyone looking for a high quality hitch to install on pickup trucks, mid-size campers, SUVs, etc. The installation is an absolute breeze with no drilling required. Moreover, it is made to last longer with the steel frame and coatings that protect against the UV damage. I also like its compatibility with the weight distribution hitch that can extend its capacity. The trailer hitch by Rapid Hitch comes with adjustable and versatile ball mount. Because of this versatility and adjustability, it can be installed on a range of vehicles. Furthermore, it comes in different sizes. I would recommend it to anyone looking for a hitch to haul moderately heavy trailers. A capacity of 10000 lbs and a tongue weight of 1500lbs make it a go-to trailer hitch for heavy loads. What also caught my eyes is the reversible balls sizes 2-inch and 2-5/16-inch. If you are worried about rust, the aluminum and zinc alloy provide a solution for you. Aluminum is, in nature, a good deterrent of corrosion, so you need not worry about putting any coating or paint on this trailer hitch. What I recommend is to continually polish it just to make the aluminum shiny and attractive. This trailer hitch bears a V5 and SAE J684 certifications. That’s a quality assurance on a US-made trailer hitch. Good for heavy loads with a maximum weight of up to 10000 lbs and tongue weight of up to 1500 lbs. 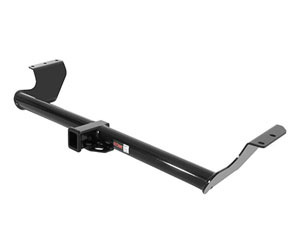 This trailer hitch is great for those wanting to haul heavy loads. It has a capacity of 10000 lbs and tongue weight of 1500 lbs, so these make it a go-to hitch for large trucks and commercial vehicles. However, do not exceed the minimum load capacity. But I do not recommend it for small cars as it may be too heavy for them. For those concerned with corrosion, it is advisable to consider this hitch. However, aluminum is not stronger than steel. For advanced durability I recommend a steel trailer hitch. Here we are at it again, Curt, a well-known manufacturer of a variety of trailer hitches. The Curt 45900 brings a whole host of features that enable an attachment of a variety of trailers. I give it a thumb up for those looking for an adjustable ball. Those that own multiple trailers will understand how tedious it is to change the ball mounts because every trailer is tailor made for its ball mount. Thanks to the multipurpose towing solution that this trailer hitch delivers. It has ball sizes of 2-inch and 2 5/16 inch. The shank is also adjustable and has multiple holes when you want to adjust heights. The first size has a capacity of up to 10000 lbs and the second has 14000 lbs. When hauling heavy loads, in particular, I care about the durability of the hitch. The steel construction provided by Curt is convincing enough. The black powder coat finish protects against possible corrosion. I am also grateful of the channel-style design and the dual-pin mounting system for the elimination of irritating noise that I saw in other trailer hitches. Thanks to the integrated anti-rattle feature for this purpose. You are probably tossing fingers wondering if this is the best hitch among all. Well, Curt has been providing quality hitches. However, not all are suitable for all types of vehicles. This one is more suitable for mid-sized SUVs, pickup trucks, and other heavy loads. I like its versatility of adjustable ball mounts as it helps one to mount different trailers. It has great features that would invest in a blink of an eye. The 180° Hitch by Weigh Safe is also making a mark in the industry of quality trailer hitches. Would you want to test its efficacy? Probably my word for it would be sufficient because I test and give unbiased review of the products I come across. I’ve also heard from a number of customers and realized many of them are quite impressed too. With the reality of having more than two trailers needing different ball mounts, the adjustable ball mounts were designed. There is one at the top and the other underneath. I am impressed by the capacity of either ball mount in withstanding high gross trailer weights. For instance, the 2-inch ball withstands up to 8000 lbs and the 2-5/16 withstands up to 14500 lbs. Combined with a tongue weight of 2200 lbs, the hitch can be ideal for heavy loads. The rustproof aluminum construction gave me assurance that the hitch will not be prone to corrosion or any harsh environmental conditions. But the ball mount is made of quality stainless steel. The V4/J684 certifications for quality assurance are also met. Update: The Company has noticed that the lower ball was often exposed to damages where it comes in contact with the road. This was mainly caused by the less attention by the drivers when they turn the tow-ball around. The knob was therefore included on the lower backside of the bar in order to prevent this possible damage to the lower ball. Still stuck in your thoughts? I would recommend this trailer hitch if you intend to haul different loads. Its adjustable ball mounts allows for this convenience and versatility. I wouldn’t want to fall for single ball mount hitches. But this one may not be ideal for small cars. Full-sized cars and mid-sized trucks are ideal for it. Reese Towpower is another impressive class 3 trailer hitch by this company. Not only was I caught by the lower price, but its quality performance when hauling moderate loads. The gross trailer weight of 5000 pounds is enough to pull a week’s long vacation gear or my boat to the sea with the tongue weight of 500 pounds. The harsh environmental conditions can be detrimental to the durability of trailer hitches where they end up rusting. A MetalShield protective coating in this hitch enhances corrosion resistance. It also boosts the OEM quality protection. The computer-aided design assured a quality design. It is coupled with fatigue and stress testing results that also assures me durability of this hitch. My only drawback is the hitch accessories that you have to purchase separately. But one can understand since the price tag is affordable. The Company is renowned for its custom-fit hitches per the vehicle make, model and he year. This ensures a proper installation without drilling needed. In fact, you can install it yourself without the help of anyone. Also impressive is the all-welded constructions which further reinforces the toughness of this hitch. However, be sure of the maximum allowed loads compatible with it. The V-5 CSA and SAE J684 certifications have also been satisfied. What’s your take after reading the aforementioned product? Well, I would recommend it for those hauling small trailers with small cars or mid-sized cars. Its maximum capacity is 5000 lbs. I have not tested the weight distribution hitch not it, but I assume it can help extend the capacity that the hitch can withstand. If you’re tight on budget, this could also be a great deal. As in the name, this is a hidden hitch that can appeal to most car owners including me of course. When not in use, I can simply take it off my vehicle. The drawbars and the ball mounts are removable. Reinserting is easy because of the ease of installation. However, the ball mount, hitch ball, clip and pin are sold separately. Hidden Hitch Class 3 can be an advantageous add-on to your tool collection. Its 2-inch receiver square tube can withstand loads of up to 5000 lbs with a tongue weight 500 pounds. As vehicle owners we care a lot about corrosion of our tools, so this hitch comes standard with corrosion resistant coating. Quality rustproof coating has been sprayed on it to make it last longer. The steel construction also makes this product a high-performance tool ideal for small cars, mid-size pickup trucks, and mid-sized cars. Note that you have to purchase the mounting hardware separately. So budget enough before considering this trailer hitch. Just one of the class level 3 I would like to invest in because of its features. As in its name, I like its removable drawbars and ball mounts when not in use. Moreover, overall performance impressed me. However, I dislike the idea of selling the hitch accessories separately. Besides, the hitch price is also fairly higher. Nonetheless, I still give it a thumb up! I have always thought that lower priced products are of an inferior quality until I came across the Draw-Lite trailer hitch. It costs relatively cheap, but has impressive features nonetheless. The first attraction goes to its all-frame attachments and all-welded solid construction that assures us durability and quality performance in our hauling endeavors. Yet again contrast to my belief, this lower priced hitch rates up to 4000 lbs. It is undoubtedly suitable for moderate loads such as vehicles, light trucks and medium-sized vans. Its square tube receivers are compatible with a wide variety of vehicles. Installing it is also a cinch. No welding or drilling is required. Only simple bolts are needed to connect it to the vehicle and the trailer. On top of that, with the lower price tag, the all installation accessories are included. The frame is corrosion resistant. If you think of embarking on a road-trip with mid-sized trucks, vans or trailers, you might find this hitch advantageous. Oh, lest I forget, it can carry up to 5000 lbs with the weight distribution hitch. Draw-Rite, unlike popular hitches with ball mounts to haul trailers, has its unique design. It is still capable of hauling moderate loads and fits trucks, vans and vehicles. But it may not be suitable for heavy loads. I like it! Also impressive is its ease of installation. I don’t need to drill or to weld in order to connect it. The all-welded construction enhances its strength and durability. For those tight on budget, here’s your product. The Trimax TRZ8AL also caught my attention with its custom features. Need I say more the significance of adjustable ball mounts? This is probably what every vehicle owner would love. It comes with dual hitch ball and a weight capacity of 10000 lbs with a tongue weight of 1500 lbs. The ball sizes include the 2-inch and the 2-5/16 chrome balls. 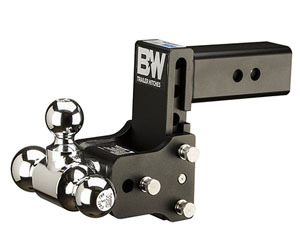 The ball mounts can adjust in increments of an inch up and down. It makes it easy to haul trailers at any preferred level. The other impressive feature I adored was the receiver lock which assures optimal security. Thanks to aluminum construction for the lightweight and corrosion resistant features vested in this trailer hitch. Also noteworthy is the provision of 8-inch rise or drop for added convenience of handling your trailer. For those looking for moderately heavy loads, I would recommend this trailer hitch. It comes with the adjustable ball mounts at increments of 1-inch up or down. However, for heavier loads I do not recommend. Rather consider higher classes. Reese Towpower 51146 Class 3 is among the flagships of Reese Towpower. The company manufactures custom-fit trailer hitches in line with vehicle’s manufacturer weight specifications. Check your owner’s manual to confirm if your vehicle will be compatible with this class 3 trailer hitch. To ensure a proper fit on a vehicle, a computer-aided design was made. Furthermore, the fatigue and stress testing were also ensured to enhance the durability. The hitch has a gross towing weight of 5000 pounds and a tongue weight of 500 pounds. I can haul moderately heavy loads with mid-sized trucks, full-sized cars, utility vehicles, etc. Reese Towpower ensured that the hitch meets the V-5 and J684 standards that enforce quality standards and workmanship. Again, the Company made use of the MetalShield protective coating to protect the product against rust and corrosion. It was further dipped in the E-coat electrostatic coating to enhance its durability. Installing the trailer hitch is something I found quite intriguing because I needed no drilling or welding. One attribution to this is because of the custom-built in accordance with the manufacturer, model and year of the vehicle. This confirmation rests in you to check the owner’s manual and check the exact specifications. I have always been loyal to Reese Towpower in their production of a wide range of trailer hitches. This one is still impressive with interesting features. I certainly recommend for those looking for quality trailer hauler. However, those comfortable with the balls and ball mounts will not find this convenient. I have a full support for ball mount adjustments. Hitches are indispensable tools for those hauling trailers, boats, horse trailers, etc. But, owning one takes lots of efforts because you have to be familiar with its features to avoid wrong picks. The technical terms can also confuse many prospective buyers. I have summarized for you some technical information you need before buying your long-lasting trailer hauler. It is a trailer hitch designed to haul trailers with a gross weight of 6000 pounds with a tongue weight of 600 pounds. Typically, it can be mounted on full-size SUVs, vans, utility vehicles, pickup trucks, etc. It comes standard with 2 x 2-inch receiver tube for the ball mount. When used with the weight distribution hitch, it can increase the trailer weight capacity. Yes you do need it. Trailers may require different hitch ball heights. You might find out that the distance from the ground to the trailer coupler does not match with the one from the ground to the hitch ball. If the one of the hitch ball is higher, then you need a drop hitch. That will be best if you find adjustable hitches. It’s actually simple to determine that using some simple mathematics. You must measure the distance from the ground to the trailer coupler, then measure again the distance from the ground to the top of the hitch. Then take the difference between them. That will be the drop you need if your trailer coupler is lower. Let’s say the distance of the hitch height is 15 inches and that of the trailer coupler is 8 inches. You need 15 – 8 = 7 inches of a drop. The standard diameter sizes of the trailer hitch ball are 1 7/8 inches, 2 inches and 2-05/16 inches. The trailer hitch height can differ from one trailer to another. But, on average, it ranges from 15 to 17 inches. Class 2 hitches use a 1-1/4 x 1-1/4 inches receiver tubes for the ball mount whereas the Class 3 use 2 x 2 inches receiver tubes. Need more clarity? Class 2 ball mount are designed to haul up to 3500 lbs whereas class 3 haul over 3500 lbs to 6000 lbs. So it is not advised to use a class 2 ball with a class 3 hitch. It’s a component that is attached to the back of the vehicle for towing purposes. It is found in class 1 through to class 5. And it works well with ball mounts. This hitch is common in class 3 and 4. It helps distribute the weight evenly and even extend the capacity of the hitch to support more trailer weight. That’s the end of my comprehensive buyer’s guide for those looking for the best trailer hitch. You are surely in a good position to purchase the best hitch with the right features that are compatible with your trailer and your vehicle. Finding the best trailer hitch is not an easy task, but with this guide I guarantee you the best. I have hand-picked the best products currently on the market to narrow down your search. I personally would go for B&W Tri-ball hitch.